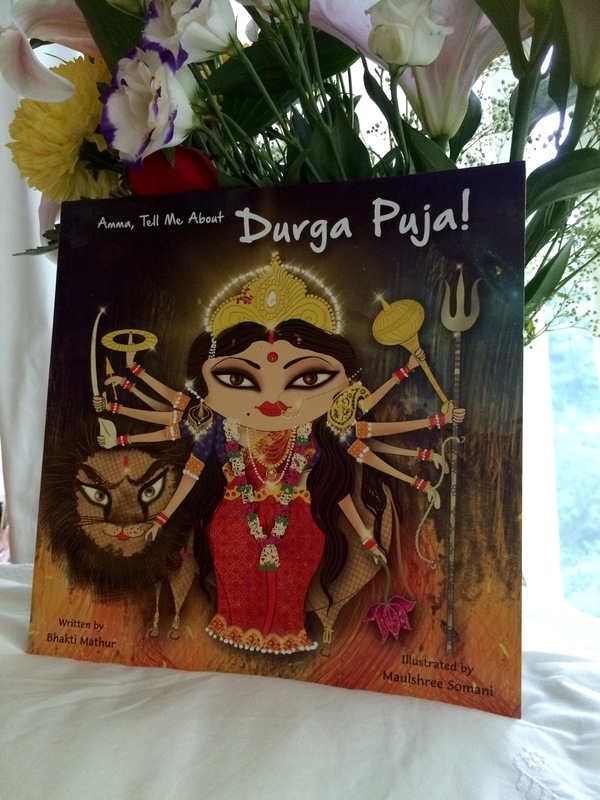 Amma tell me about Durga Puja – A Giveaway! The first time I got acquainted with the ‘Amma tell me …’ series was when I won the ‘Amma tell me about Diwali‘ book in a giveaway contest organised by a Hong Kong based parental portal. I rarely win these kind of contests and hence was pleasantly surprised when the book came home. So today it gives me great pleasure to organise a giveaway where I get to send these beautifully illustrated books to four lucky winners from India and Hong Kong! None of this would’ve been possible without the support of this book’s author Bhakti Mathur! This vivacious, omnipresent author who has a full time job in a bank, who takes pleasure hiking in every possible trail in Hong Kong with her family AND who does book reading sessions for every other International school, has found the time to write yet another book to add to her series! I always used to wonder where all that energy came from….till I read her latest book ‘Amma tell me about Durga Puja!‘ The books takes a reader through Durga puja traditions and celebrations in a city in India as seen through the eyes of the familiar characters of Klaka and Kiki, and then takes them to the raison d’être of Durga mata, the most powerful woman-God in Hindu mythology. To enter the giveaway all you have to do is fill in this form which includes a free subscription to my blog and just keep your fingers crossed till we announce the winners! Please note that this contest is open to Indian and Hong Kong residents only. The last date of sending your entry is Monday, June 27. The winners would be announced on our Facebook page by Wednesday, June 29. Sorry! The giveaway has ended. The winners would be contacted individually and their names would be announced in this space shortly. Thank you for visiting. Amma tell me about Bhakti!